Chandigarh, Adjacent to Punjab and Haryana (1 listing). New Delhi, National Capital Territory of Delhi (3 listings). Kanpur, Uttar Pradesh (1 listing). Kolkata, West Bengal (2 listings). Hyderabad, Andhra Pradesh (3 listings). Chennai, Tamil Nadu (44 listings). The Indian Storytelling Network was founded in Dec 2011 by Geeta Ramanujam (director of Kathalaya and its Academy of Storytelling in Bangalore); and Eric Miller (director of the World Storytelling Institute and facilitator of the Chennai Storytelling Associaton in Chennai). The ISN is inspired by the International Storytelling Network (based in Spain), the USA National Storytelling Network, and other Storytelling Organisations around the world. The founding of the ISN might mark the coming-of-age in India of the global Storytelling Revival, which began in the late '60s in places such as the USA. The Indian Storytelling Network builds upon India's myriad splendid ancient Storytelling traditions. The Indian Storytelling Network is dedicated to facilitating the development of Storytelling in India, with Storytelling being defined primarily as the telling of Stories with one's body and voice -- perhaps with visuals such as costumes, puppets, and props, and perhaps with electronic assistance -- in live performance, that is, in social events in which all participants can give feedback to each other as the event unfolds. Letting members of the public know what Storytellers in what locations are available as performers and trainers. Enabling the Storytellers to network amongst themselves. Communicating with other Storytelling Organisations around the World. Developing ways of using Stories and Storytelling for Education (including as parts of School Curriculums). The ISN aspires to be a resource for Educators. Developing ways of using Stories and Storytelling for Therapy (Psychological healing). It is time for Storytelling Therapy to take its place alongside Drama Therapy, Dance Therapy, Music Therapy, Art Therapy, and Play Therapy. Developing ways of using Stories and Storytelling for Coaching. The ISN draws upon many ancient Indian traditions regarding developing ways of using Stories and Storytelling for Education, Therapy, and Coaching. Conducting research regarding forms of traditional Storytelling in India; documenting these traditions, supporting continuations and modernisations of these traditions, and presenting all of this to the public. Exploring ways of telling traditional Indian stories to members of the contemporary Indian public -- in the Vernacular languages, and in English, to help further develop the Creativity, Compassion, Powers of Imagination and Reasoning, and Communication Skills of all concerned. The fee for a listing (with bio-data, description of Storytelling-related services offered, etc) is Rs 500 per year. For additional details, please e-mail to info@indianstorytellingnetwork.org . is the Indian Storytelling Network's email group. and one's email ID is added to this email group. To join (Chennai-based) World Storytelling Institute's e-mail announcement group, please e-mail to info@storytellinginstitute.org . To join (Bangalore-based) Kathalaya's e-mail announcement group, please e-mail to kathalaya@gmail.com . To join Storytell, a global discussion group about storytelling, please click here. Kathalaya is setting up resource centers called Story Spaces. So far, Story Spaces are developing in Mumbai, Mulund (Mumbai), Kanpur, Ahmedabad, Chennai, and Madurai. Story Spaces could exist in schools, activity centres, or as individual undertakings. Additional info is here. For info: 080 2668 9856, kathalaya@gmail.com . The World Storytelling Institute has helped to found Storytelling Associations in Chennai, Madurai, Coimbatore, Salem, and Ahmedabad. One-on-one and group training is available via (Zoom) videoconference. Links to 16 videoconferences Dr Eric, WSI Director, has co-facilitated are here. Additional info about the WSI's training ia videoconference is here. Most of the individuals listed on the ISN website are happy to travel throughout India to perform and/or train. Dates: 22nd Nov to 1st Dec 2018. Dates: Fri 1st to Sun 10th Feb 2019. A recording of a recent (2017) by Ms Geeta Ramanujam, Director of Kathalaya, is here. Articles providing evidence that Storytelling can contribute to Education. "Ways Storytellers are Using Audio- and Videoconferencing for Training, Discussion, and Performance", 12-page section of Storytelling Magazine, guest-edited by Dr Eric. "Story and Storytelling in Storytelling Therapy and Expressive Arts Therapy". "Expressive Arts Therapy -- including Storytelling Therapy -- in Cultural Context"
"Becoming Oneself: A Goal in Carl Jung's Conception of Therapy"
"Review of a Drama-and-Movement Therapy Workshop"
"Variations in and of the Story of the Silappathikaram (the Epic of the Anklet)"
"The Storytelling Scene in Chennai". "Ways Storytelling Can be Used for Teaching-and-learning". "Child Development, Arts Therapies, Education -- and Storytelling". "Aspects of the Storytelling Revival in India". "Dance, Movement, Gesture, and Posture in Storytelling". "Storytelling by and for Adults at a Café Coffee Day!" 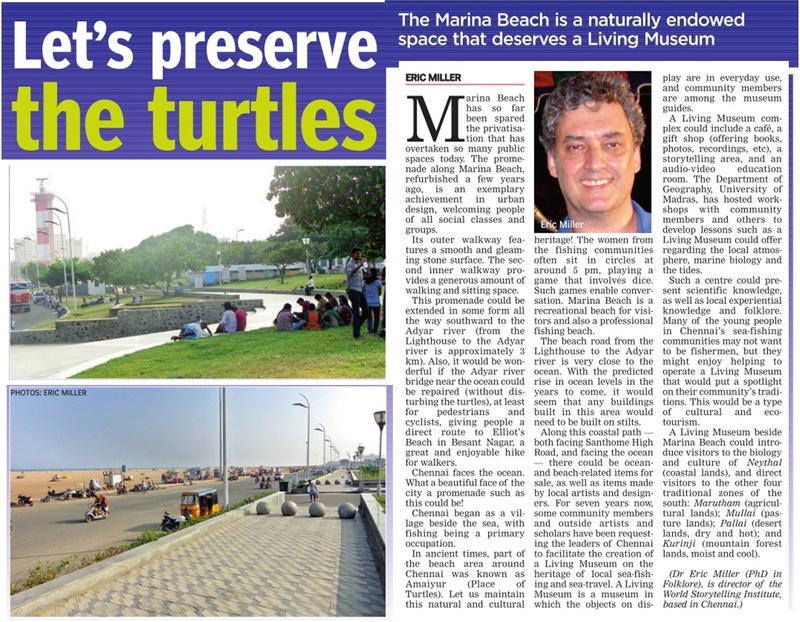 "Chennai's Marina Beach Deserves a Living Museum"
"Theories of Story and Storytelling". "Verbal Play and Language Acquisition". "Using Storytelling to Encourage Reading". Intellectual, Emotional, and Social Development". "The Value of the Multi-Discipline Approach to Research". "Storytelling Studies, and Subbu Arumugam's Villupattu (Bow Song)"
"Roleplaying in an African Storytelling Event". "Continuity and Change in Chinese Storytelling". "The Performance of Epic and the Practice of Lament". "Turn-Taking and Relevance in Conversation". "Storytelling in the Age of Videoconferencing"